The region located at the southwestern edge of Toyama Prefecture is one surrounded by mountains as high as 1500 m and inundated with 2 to 3 m of snow in the winter. Alongside the clear stream flowing 115 km from the Hida highlands to the Japan Sea (designated a class A river by the government) are 5 valleys dotted with 40 villages. 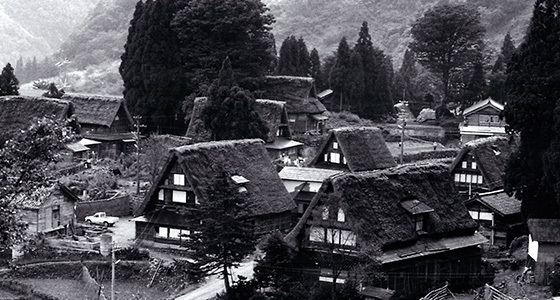 Of those, Ainokura and Suganuma Villages were designated UNESCO World Heritage Sites in 1995 (Heisei 7) together with Ogimachi in Gifu Prefecture’s Shirakawa-go. The use of the name “Gokayama” for this region can first be seen during the Muromachi period as noted down by Jitsunyo, the 9th head of Honganji Temple, in 1513 (Eishou 10). 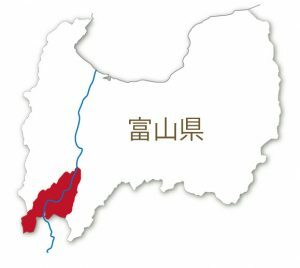 The name came about as a general term referring to the groups of villages that had sprung up in 5 areas of the region: Akaodani Valley, Kaminashidani Valley, Shimonashidani Valley, Otani Valley, and Togadani Valley. 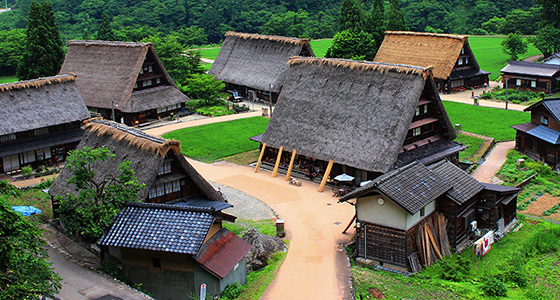 During the rule of the Kaga Clan, there were about 70 villages. 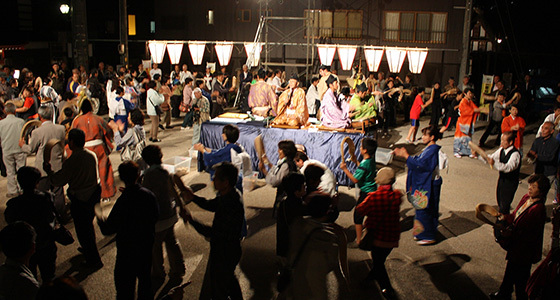 Today, the former Taira Village＊ in which Ainokura Village is located and the former Kamitaira Village in which Suganuma Village is located are together generally referred to as Gokayama. The history of residence in this area is very old, dating back to the Joumon period and reflecting aspects of the ancient, medieval, and modern ages. Surrounded by geography and natural features distinct from the plains area, a unique culture arose in this region. ＊On November 1, 2004, 4 towns and 4 villages (Fukuno, Fukumitsu, Inami, Johana, and Inokuchi in the southern plains area of the Tonami region and Taira, Kamitaira, and Toga in the mountainous region) were merged to form present-day Nanto City. 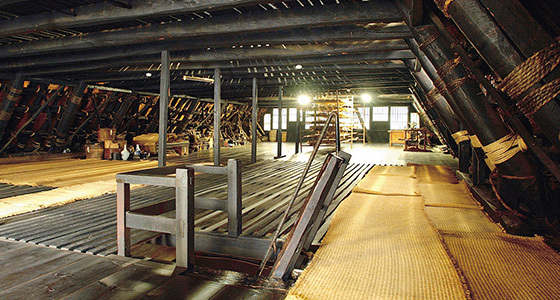 ＊Gokayama measures about 21.7 km from east to west, about 22 km from north to south, and 18,879 ha in gross area.